Double Glazing Versus Triple Glazing: What are the Differences? 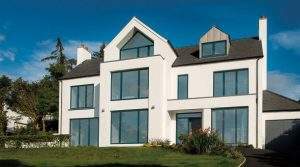 Home » Blog » Double Glazing Versus Triple Glazing: What are the Differences? The technology behind common windows has come a long way in recent years. Not only do you now have a choice of materials and design options, but their thermal benefits have dramatically increased. This is primarily due to the process of glazing. Glazing involves the presence of additional panes of glass; enabling homeowners to save a substantial amount of money on heating and cooling costs over time. Double- and triple-glazed configurations are often selected and yet, how do they differ from one another? Which one should be selected in order to accommodate the needs of your property? In order to understand the difference between double and triple glazing, it is first important to examine the science behind this technology. We will then move on to take a look at some disparities between the two. How Does Window Glazing Work? Glazed windows consist of multiple panes of glass separated by a thin layer of air. The main principle behind this design involves the fact that air is a poor conductor of heat. In other words, these windows provide excellent levels of thermal insulation. Not only will they keep warm air inside of the home, but they are capable of preventing cool air from entering. When we consider that a typical home may lose as much as ten percent of its internal heat via the windows, the importance of glazing becomes exceedingly clear. Now that we have a basic understanding of glazed windows, let’s take a look at the differences between double- and triple-glazed models. As you may have already guessed from the terminology, the main disparity between these two versions is simply the number of panes which are added. Double-glazed windows contain two panes of glass while triple-glazed units are equipped with an additional layer. This will dramatically impact the levels of thermal insulation that you can expect to enjoy. One important point to mention here is that the typical thermal properties of an window are measured with what is known as a “G value”. G values represent how much solar energy is allowed to pass through a window. Lower values are therefore associated with higher levels of insulation. Most double-glazed windows are associated with a G-value of approximately 75 per cent. On the contrary, those with triple glazing might boast values as low as 35 or 40 per cent. This simply signifies that less heat is lost through conduction when referring to triple-glazed variants. The most obvious factor involves where your home is located. Those living within colder environments will normally benefit from the introduction of triple-glazed windows. This is particularly relevant when referring to windows that are not exposed to a great deal of sun during the winter months. It might be wise to consider triple glazing in such locations. Still, you might be very surprised to learn that warmer climates can also have an impact upon choosing double glazing vs triple glazing. This is due to the “greenhouse effect”. Windows that face to the south or to the west will be exposed to high levels of solar radiation during the warmer months of the year. The associated rooms can become extremely hot and uncomfortable. Such situations can often be addressed with the use of triple-glazed panes as opposed to their double-glazed counterparts. The final issue involves the cost of the windows themselves. While triple-glazed units will be priced slightly higher, never forget that the money saved in regards to heating and cooling costs can help serve to offset this initial fee. Both variants are extremely durable and they will last for decades at a time if cared for properly. While there is more than one difference between double and triple glazing, the bottom line is that either of these configurations will provide your home with money-saving benefits as well as superior levels of comfort. If you would like to learn more about which one is the most suited for your unique needs, please get in touch with us here at Benchmark Windows today on 01903 680512!